Too cool for ski school? Our Steep ‘n Fast lessons are perfect for advanced teenage skiers looking for fun and a new challenge. This is the start of adventure skiing, with lessons on racing techniques, moguls, off piste and the beginnings of freestyle. Participants must be confident, experienced skiers to take part, and must be willing to follow instructions as they will encounter more risky terrain. If conditions are right, they’ll start to learn powder skiing and be taught about avalanche awareness. 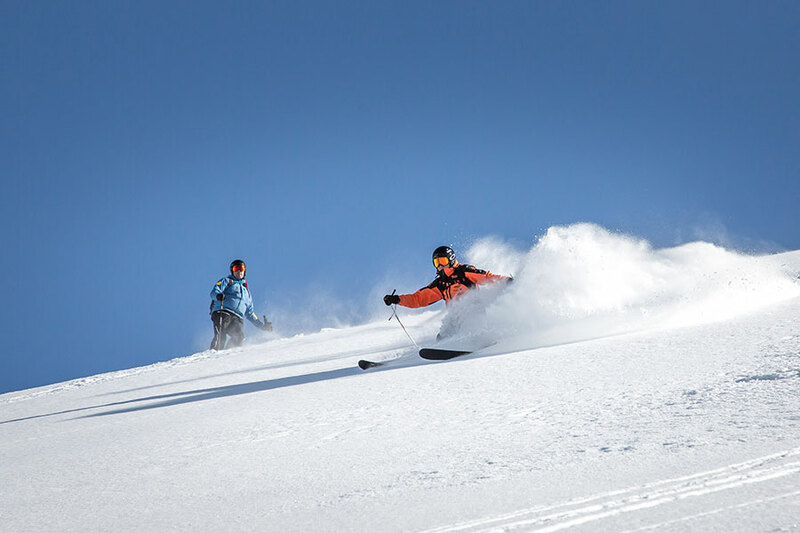 Whatever the weather, advanced teenage skiers will focus on perfecting their ski technique for ultimate control and improved style on all terrains. This group is exclusively open to advanced teenage skiers aged 10 to 17 years. Participants must be confident, experienced skiers to take part, and must be willing to follow instructions as they will encounter more risky terrain. Minimum level of ability : participants must have already achieved at least the ESI Diamond Crystal medal or the ESF Gold star. Please refer to our level descriptions. In order to be comfortable in this group, advanced teenage skiers should be confident skiers over all kinds of terrain, including off-piste and steeps. Our Steep ‘n Fast groups run for 5 sessions, Monday to Friday. My two eldest (14 and 16 years of age) had become really disenchanted with ski school and “too cool” to take part, but they loved your Steep ‘n Fast groups as they were no longer treated like kids. They went all sorts of places we could never have taken them and loved all the off piste adventure stuff. We were glad they’re being taught mountain awareness as they go too, so hopefully they’re becoming more respectful instead of just going gangbusters! They worshipped Adrien and seemed to hang on his every word. All in all, it’s a great product you’re running!